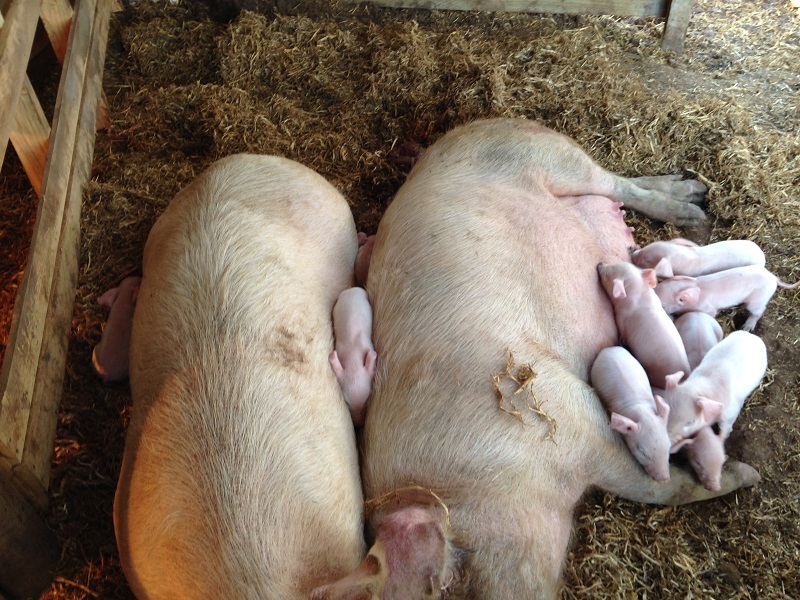 After visiting an Ethicurean Pig Farm in Victoria a few months ago, we had decided to try farrowing our pigs in pairs. They apparently do it with great success, and the benefit of having them all in a social/family group seemed self-evident. 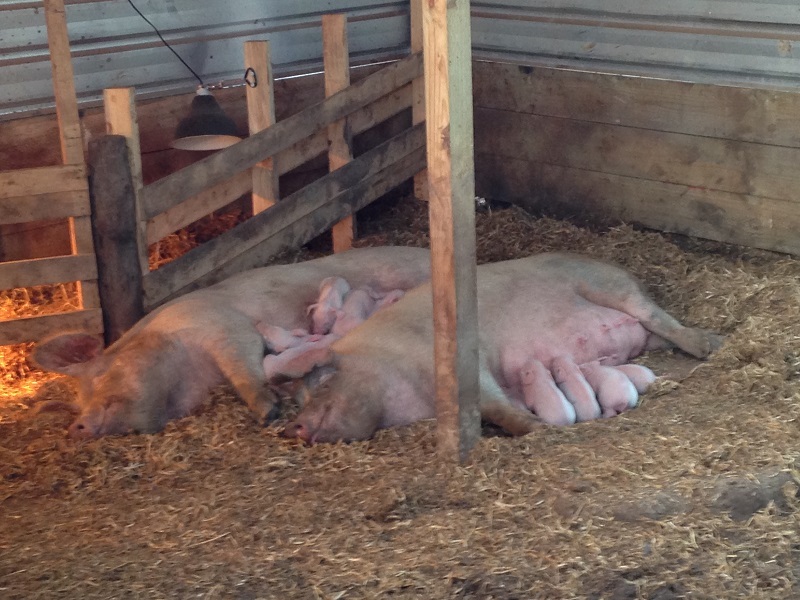 My concern was the higher risk of piglet mortality through squashing, but we were told that this wasn’t a big problem. The other important thing to understand here is that this is all still a learning experience, and we’re going to have to try a heap of different things before we find exactly what works for us. Unfortunately, our largest learning opportunities come from the times where things go awry, and that’s the case here. Both girls were due near the start of August. Both had been in with Boris at exactly the same time, and we’d seen him couple with the both of them on the same afternoon. However, they were in with him for a couple of weeks, and there’s really no telling exactly when they got pregnant, or if they got pregnant at the same time. In addition to this, there can be some variation in how long they’re pregnant for. The result is that we know the earliest date they could be due (112 days from when we saw them first couple), but it could actually end up being some days later. Ziggy was huge, while Stumpy seemed much smaller. We’d been thinking that Ziggy would go first, simply because her belly was nearly dragging on the ground and she was clearly uncomfortable. However, in the end it was Stumpy who dropped first. Stumpy starting her first litter. Stumpy’s first two. 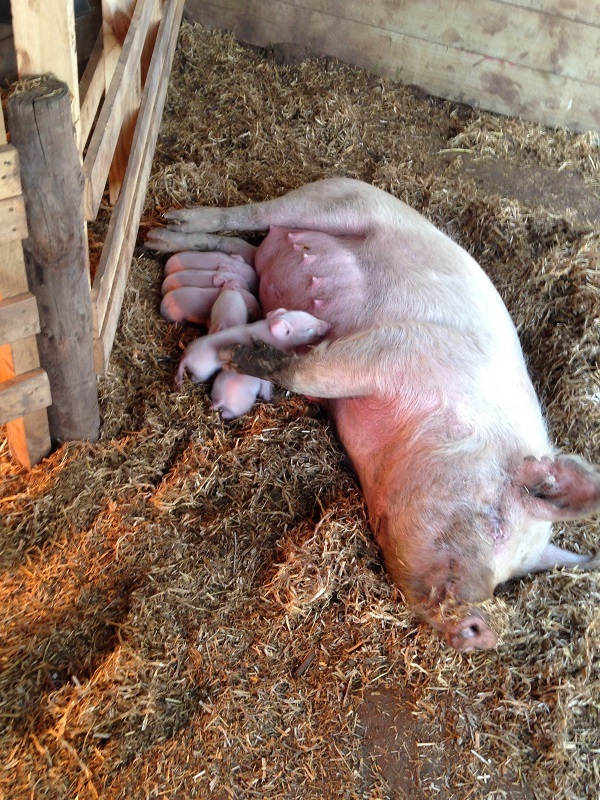 She was apparently a little distressed between births, and would get up and move the piglets around. 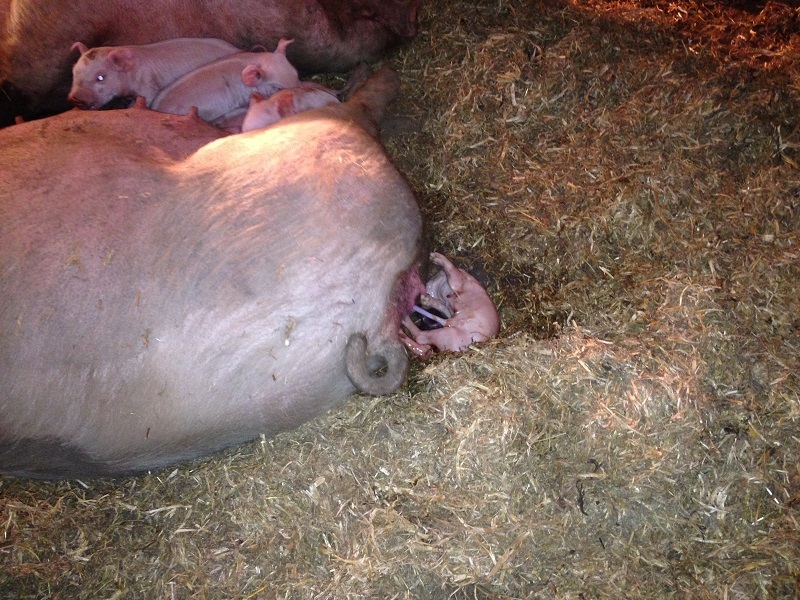 Stumpy nursing her first 5 as she finishes giving birth to the last one. Stumpy ended up having 6. That’s not terrible for a first litter, but we’d be expecting nearly twice that for subsequent litters. She had no still-borns too, which is nice. 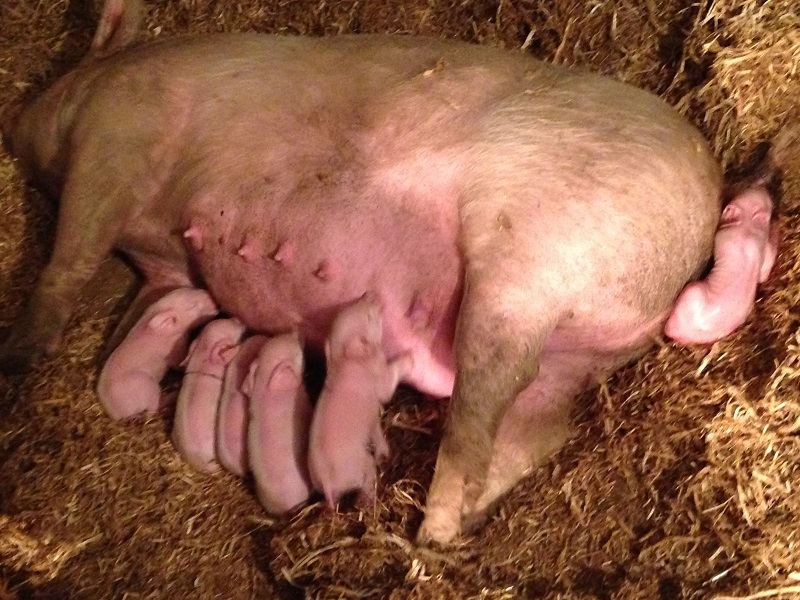 Ziggy dropped a full 4 days later, and had a whopping 13 babies! She struggled with a few of the deliveries, which is not surprising when she had so many her first time. 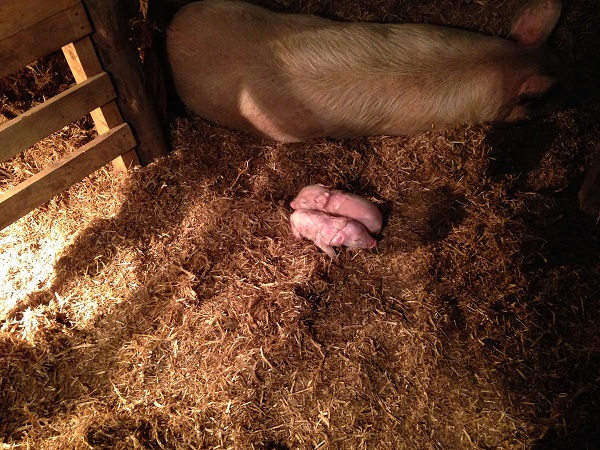 Two were stillborn, and another wandered off into the corner, away from the heat lamps, and didn’t make it. Ziggy dropping while Stumpy and her babies hang out. One of Ziggy’s first few coming out. 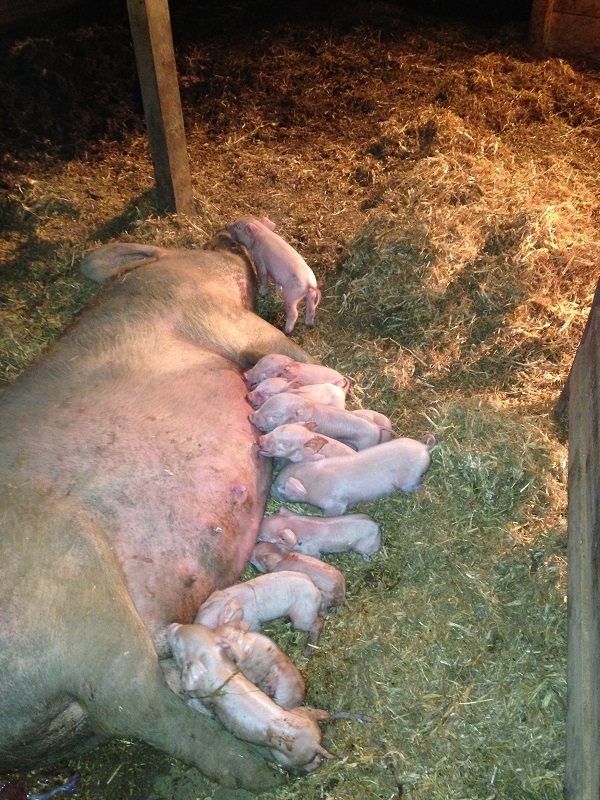 That really is a lot of piglets! We ran into problems pretty much right away. The two mums, who are sisters and have lived their entire lives together, just wanted to spoon and lay with each other. They weren’t laying against the creeps, and the babies were forced to come to them for a feed. 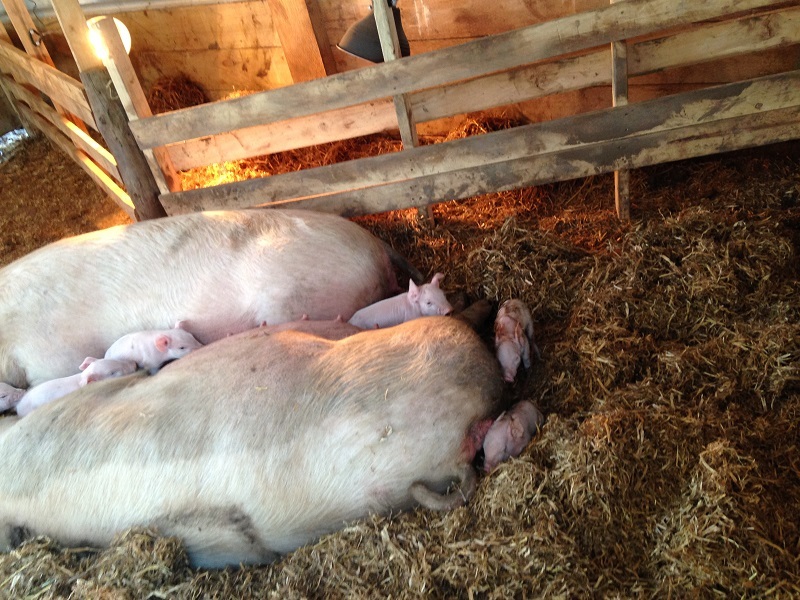 Ziggy and Stumpy just wanted to hang out and spoon, which is not surprisingly dangerous for tiny piglets. The danger is fairly obvious here. The result was that they lay on and squashed 6 babies. Combine that with the stillbirths and the one that wandered off, and we lost 9 out of 19. That is clearly something we need to remedy. From now on, I think we’ll still keep the girls in pairs, but have them give birth separately. That way we can have them tend their babies for a few days, maybe a week, and then put them in together. At that stage the babies should be large enough to avoid the mums, and the mums will be alert enough to avoid the babies. We’ll try this the next chance we get. 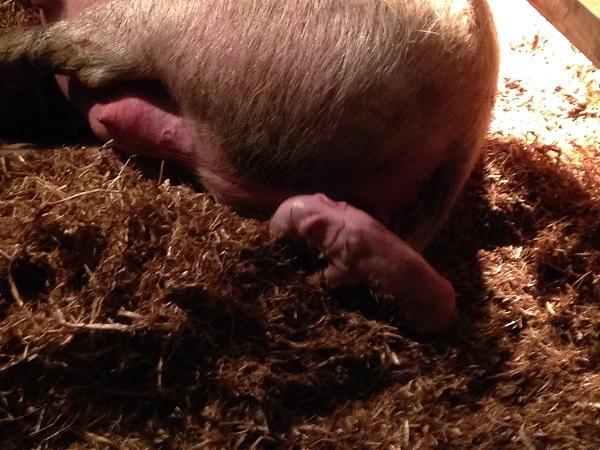 In the meantime, the new piglets are the best litter we’ve ever had. They are boofy, healthy, and robust. 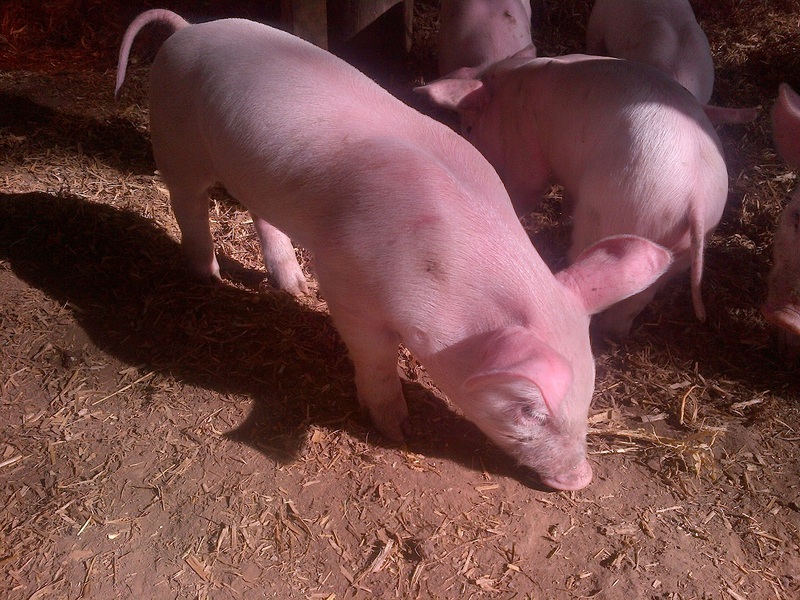 These mums were bought from a local piggery, and the blood lines and breeding are tightly controlled. They are true F1 crosses of Large White and Landrace, and the genetics are obviously part of why these babies are so solid. 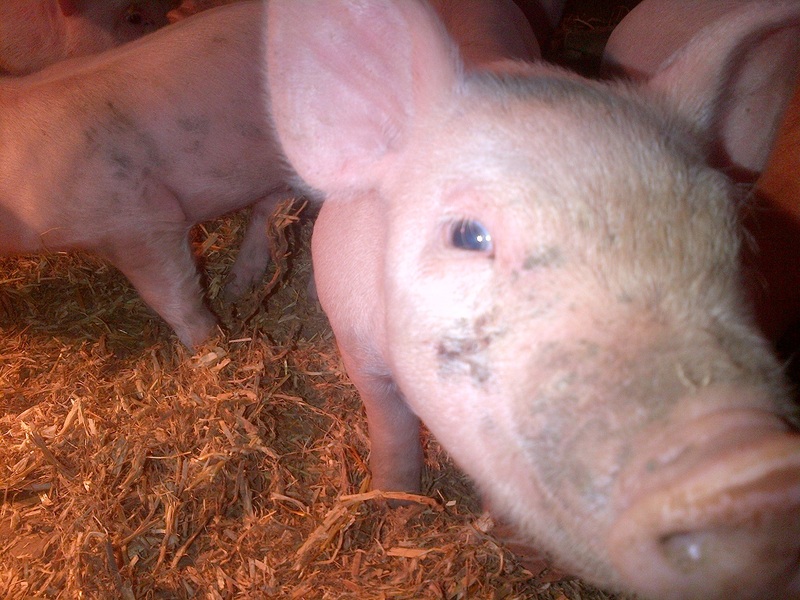 You’ll have trouble finding healthier, more robust piglets anywhere. You can see how boofy these litters are. I was away when the babies were born, and didn’t get home until they were a couple of weeks old. They are super active, running around and playing like puppies. I’ve been spending quite a bit of time in with them, trying to make up for lost time, and their natural curiousity cracks me up. We’d been debating on going with the white breeds or phasing over to black breeds. 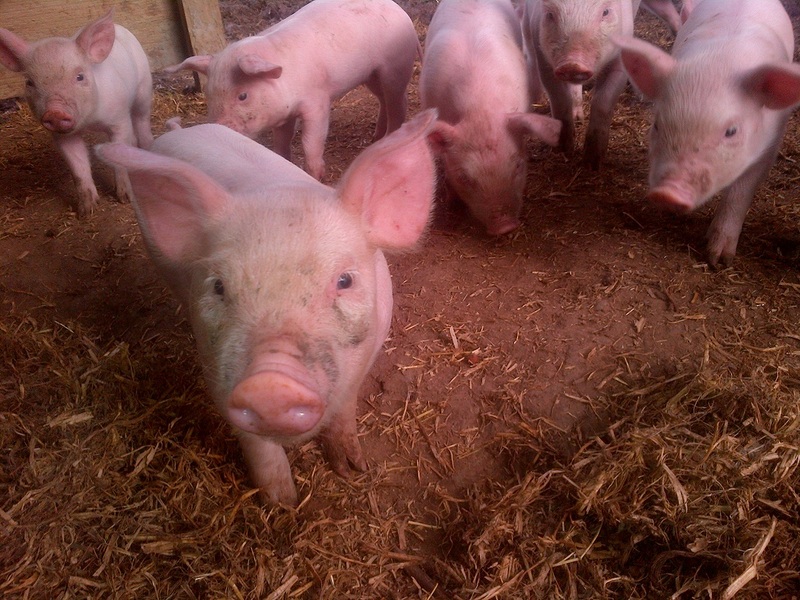 We will probably experiment with the breeds, and some cross-breeding (I’m keen to put a Duroc over both our white and our black girls), but right now I’m happy with these gilts. 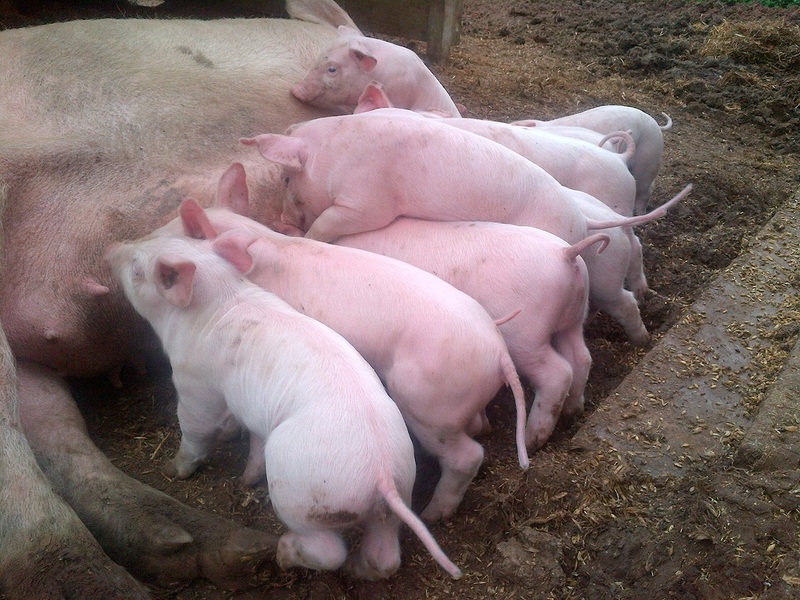 There’s something to be said for pigs that produce litters of this size, and probably more importantly, who are such amazing mums. This entry was posted in August, 2014. Bookmark the permalink.